We recently completed the installation of two new webcams, streaming from Simi Valley, California. 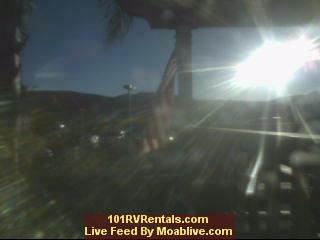 Webcam Number One streams live from 101 RV Rentals and All Valleys RV Storage. Their eight-acre storage and rental facility is located at 850 West Los Angeles Avenue, in Simi Valley, California. Two separate freeway off ramps provide easy access to and from Highway 118. At All Valleys RV Storage, 33-foot wide aisles separate 400 well-marked parking spaces. The fully fenced storage facility features gated security and 24-hour video surveillance. In addition to safety, security, and convenience, the professional landscaping and spectacular views make this a beautiful place to rent or store a recreational vehicle. Our camera view includes the landscaped grounds and the 400-space storage facility. In the background, unspoiled hills provide open space around the Ronald Reagan Presidential Library. Behind the ridge line stands one of two original Air Force One jet airplanes. One of two nearly identical airplanes served each American president from John Kennedy to Ronald Reagan. Now on featured display at the presidential library, this venerable four-engine Boeing 707 began its career in 1972. With our live streaming webcam facing southwest, you can expect to see some spectacular Ventura County, California sunsets views. Please join us often for a unique and refreshing view of Southern California at its finest. To view Simi RV Rental webcam, streaming live from Simi Valley, California, click on the webcam image above, or click HERE. 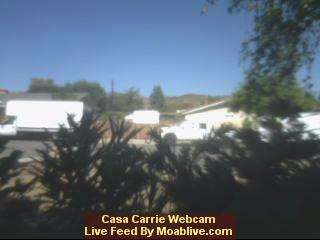 Webcam Number Two streams Live from Casa Carrie in Simi Valley, California. The Camera faces east, towards the rising Sun. In keeping with the ancient Navajo tribal tradition, each morning we face east and share with you our first rays of morning light. Framing the view is a residential street in the Texas Tract at Simi Valley. In the background is Rocky Peak, which separates Los Angeles County from Ventura County. With webcams streaming live from California, Oregon and Utah, the Moab Live group of websites is now the largest provider of low cost, streaming webcams in the Western United States. If you are interested in learning more about pre-tested, plug & play webcam systems, please contact us soon. To view the Casa Carrie webcam, streaming live from Simi Valley, California, click on the webcam image above, or click HERE.